Lethbridge is my favourite mid-sized Alberta city, with a burgeoning population that’s topped 90,000. Above all, it boasts the spectacular Oldman River Valley, incised by weather-shaped coulees and populated by giant cottonwood poplars on the river flats. If you’re travelling between northern Montana and Calgary/Banff, it’s well worth spending a couple of hours exploring the valley’s half dozen parks, linked by walking/cycling trails. 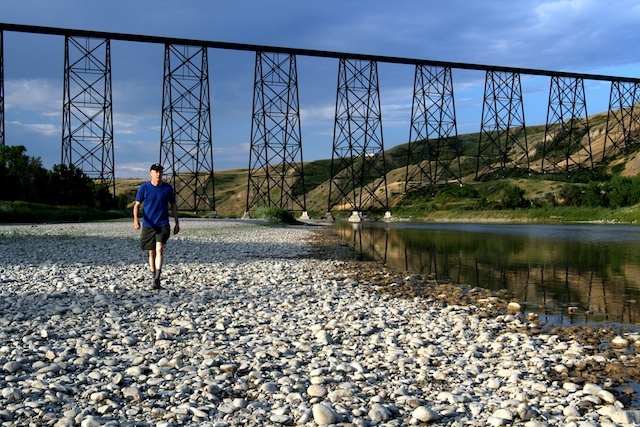 The valley is also home to two stunning landmarks: the Arthur Erickson-designed University of Lethbridge, built right into some coulees, and the old, long High Level railway bridge. Finally, there’s a considerable Mormon and Japanese influence, so you know things are generally tidy. Yeah, there’s the steady breeze, but not so bad as Crowsnest Pass to the west. The Lethbridge restaurant scene is now catching up to all this natural splendour. Most mid-sized Alberta cities tend to be culinary wastelands, dominated by chain restaurants in new malls and tried-and-true steak and pizza joints. Not so LA north (Lethbridge, Alberta), where a growing number of independent places are devoted to excellence, local products and generally supporting their community. When I spend more than an hour in a coffee shop, it’s invariably because I’m glued to my iPad and its attendant email and Internet tentacles. But at *Cupper’s Coffee & Tea, I don’t even sit down and barely have time to sip one of the best coffees I’ve had in a long, long time—a formidably strong Costa Rican, carefully poured through a Chemex dripper by David. That’s because I’m locked in an intense conversation with owner Al Anctil about all things coffee. Suffice to say, he’s passionate about his craft. 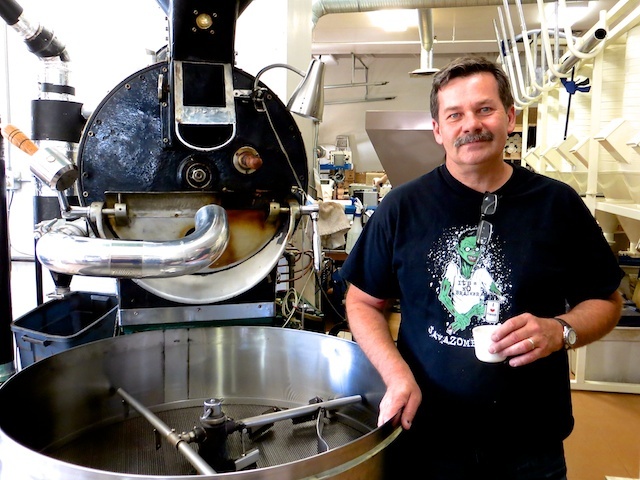 A former sculptor, Al—along with a thermodynamic PhD buddy and hot-rod building brother—built a complex roaster that allows the custom roasting of some 34 types of the world’s finest beans, none of which sit for more than three days. 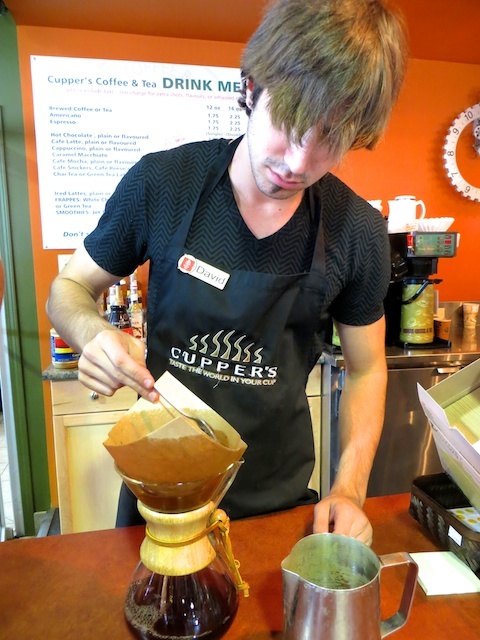 Cupper’s has only one, coffee-shaped table, with two chairs, so its espresso-based or drip coffees are mostly to go, though it does supply many local restaurants and cafes, including Anctil’s former business, Penny Coffee House. But it does have the most impressive collection of coffee- and tea-making machinery and paraphernalia I’ve ever seen. And it’s well worth picking up a pound or two of beans and getting on the mailing list. Cupper’s even ships beans to a financial company in Japan. It’s that good. I’m not sure what’s better about *Round Street Café, the food or the story. First, the food. Let’s make it simple. 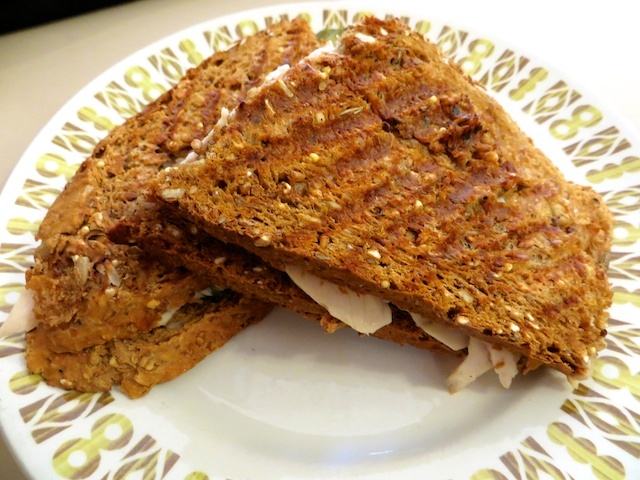 Just order the grilled chicken, brie and avocado sandwich on multigrain ($8.50), the silky combination of flavours wonderfully complemented by the seedy bread. 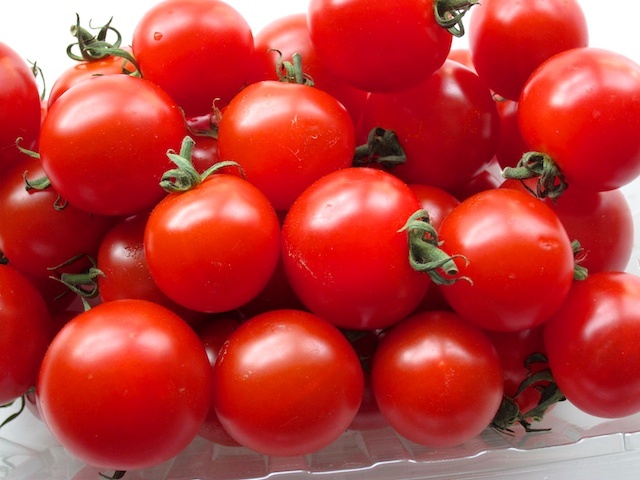 Add a soup or salad, if you wish, but make sure you leave room for a thick slice of fruit pie. Now the story—this from Cupper’s owner Al Anctil’s perspective, since Round Street owner Bonny Greenshields is not around when I stop for lunch. A retired high school teacher, Bonny wanted to start a café and consulted Al, who spent the first two meetings fruitlessly trying to convince her not to. She ignored his advice and made the restaurant successful enough to be included in Where to Eat in Canada. But the real story is how she’s helped feed and otherwise help the city’s homeless and otherwise needy folks. So, the breakfast and lunch food is fabulous, but it’s Bonny’s contribution to community that’s the real winner. Mocha Cabana is another Lethbridge restaurant devoted to fine food and community. It uses lots of locally sourced meat, dairy and vegetables and employs chefs in or graduated from the Lethbridge College Culinary Program. On weekends, they’re free to create three-course dinners, with local musicians playing in the background. But I’m here for breakfast and a delightful Mocha Scrambler. 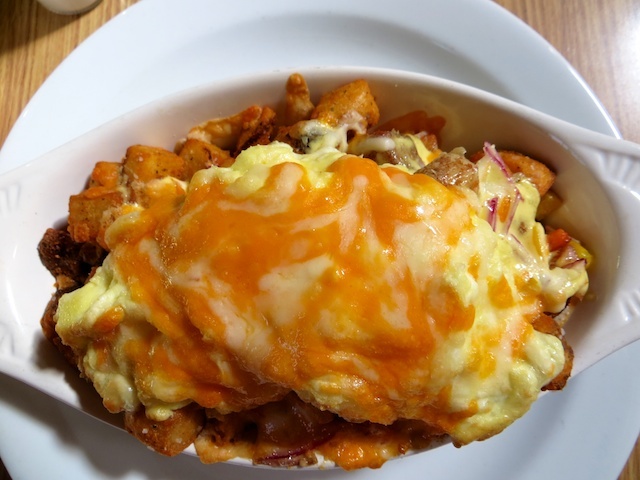 Despite the somewhat leisurely service, the dish arrives from the oven smoking hot, the cheese nicely melted with hollandaise sauce into fluffy eggs, riding atop a nice medley of pan fries, bacon chunks and red onions. It’s a filling, flavourful meal, washed down by a couple of good mugs of Cupper’s coffee. This entry was posted in Alberta, Alberta restaurants, coffee, Lethbridge and tagged Alberta, lethbridge on August 6, 2013 by bcorbett907.